Barbet, Pierre. L'Empire du Baphomet . J'ai lu 1977. 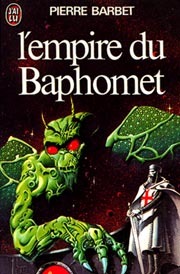 Series note: Omnibus of English translations of L'Empire du Baphomet and Croisade stellaire . What if: A demon-like alien was shipwrecked on Earth in 1118. Summary: The alien aids the Knights Templar as they set out in 1275 to save the Holy Land and conquer the Mongols. Series note: First volume of Cosmic Crusaders. Published: Fleuve Noir 1972 (2265064785); J'ai lu 1977 (2277117684). Translation: English by Bernard Kay as Baphomet's Meteor , DAW 1972. Included in Cosmic Crusaders: Two Complete Novels . Translation: Portuguese by Eurico Fonseca as Os Cruzados Do Espaço , Livros do Brasil 1980. Series note: Second and final volume of Cosmic Crusaders. Translation: English by C.J. Cherryh as Stellar Crusade , which is included in Cosmic Crusaders: Two Complete Novels . (No stand-alone English publication).